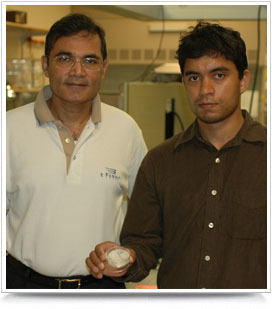 Ravi Saraf (left) and Vivek Maheshwari (right) display the touch sensor. Ravi F. Saraf, a professor in chemical and biomolecular engineering, and his doctoral student Vivek Maheshwari were featured in a story included in Discovermagazine's list of the top 100 science stories of 2006. The list is published in the January issue of the magazine. Saraf and Maheshwari's touch sensor was one of a handful of research projects produced by a small group working at one institution. Most innovations recognized in the top 100 were produced by large international teams. Saraf and Maheshwari announced their discovery in the June 9 issue of Science magazine. The sensor is a self-assembling nanoparticle device with touch sensitivity comparable to that of the human finger, a capability far beyond any mechanical devices now available. The sensor consists of alternating monolayers of gold and cadmium sulfide nanoparticles separated from each other by a thin polymer film. David H. Allen, dean of the College of Engineering, said Saraf is one of the most brilliant men he has met in his lifetime. "He is a tremendous asset to the state and the university," he said. "I am confident that this invention, along with many of his others, will go a long way to make our world a better place. I am particularly attracted to Dr. Saraf's positive and infectious attitude regarding all of his research, particularly this touch-sensitive device." Visit the Mesoscale Engineering website.